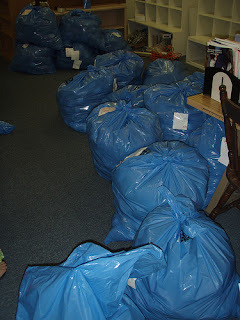 After the shop closed on Saturday, a group of us helped Florence bag and inventory the rest of the yarn - dumped into bags and labeled by type of yarn (brand), quantity and price, we filled (I think) 33 bags of yarn - over 4,000 balls! 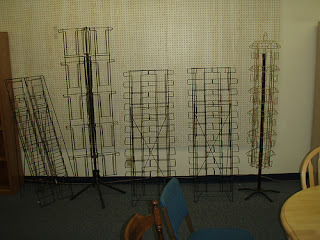 eek - it's a lot to be left over after the big blowout sale - I think Florence is going to try to sell it online -either through ebay or craigslist.... I'm not sure. 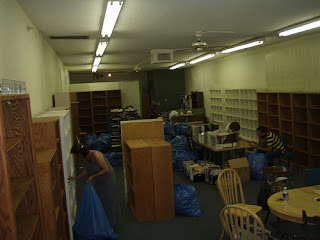 It took almost 2 hours to pack everything up. I drove by the store yesterday, and it's up for lease - the store is empty now, nothing in it - and it's very sad - sad that the "legacy" is gone - even though Florence could be cranky, it was a safe place to go and knit - and now it's gone. I'm sure most of the "gang" will still meet up at a house or somewhere else, but the "shop" not being there is just strange... it kind of feels like a death - and I'm sad about it. 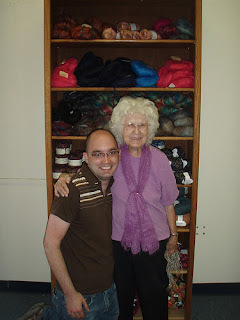 So... bye to Bishops Yarns... Florence and I took a quick photo - I got low for her because the first photo we took looked like she was standing in a hole - I couldn't stop laughing! Other news... I joined the TKGA - The Knitting Guild Association - and I signed up for the Master Knitting Program - it's a multi step program that covers many aspects of knitting - and I want to move (slowly) through the process- it's not something I'll accomplish quickly - but it's a goal and something I have wanted to do for a while. SO, for my birthday month present I bought the master class (first level) and my membership. Check out the TKGA at http://www.tkga.com/ and a link to the masters program can be found on that page. Lastly, I started my first sock... and I'm very excited about it - it's very much a beginner sock (just a rib) but I am using one of the fun self patterning yarns - and it's neat to see the colors change - I am slowly climbing down the leg of the sock - I'm anxious to try turning the heel - but I'll probably wait to do that with some friends who know what they're doing so that I don't mess it up! 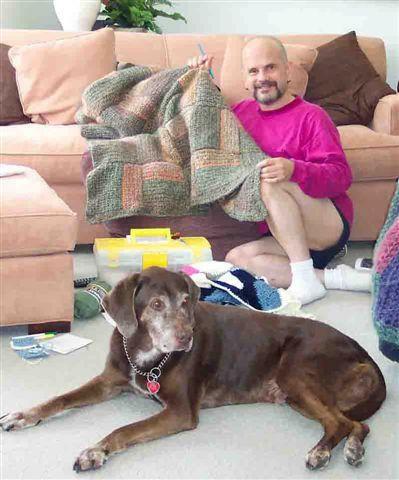 Good luck with the master Knitter class, I've always wanted to do that. And the 'standing in a hole' comment is too damn funny!